Steinbach is destined to be a cycling community, and it’s starting already! With more and more cyclists taking to the streets, South Eastman Transition Initiative has identified the need for a Community Bicycle Repair and Enthusiast Club. On Thursday, March 28, 7:00 PM, we will be hosting a meeting at the MCC Thrift Store at 413 Main Street (use the clothing donation door off the back lane) to discuss options for such a club, including volunteer opportunities, location options, and identification of services to be offered. If you’re a cyclist, this is a great opportunity to meet others who share your passion and to pass on some of your knowledge to those just starting out. If you’re just starting out, there has never been a better time to learn how to repair and maintain your own bike – as well as all the “need-to-knows” about cycling in Steinbach. 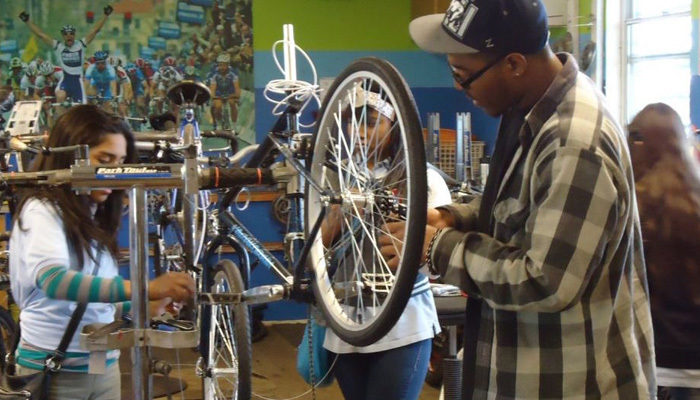 The club will bring together avid cyclists and novices around a model of “do-it-yourself” mentorship, with access to shared tools and a workshop. Experienced cyclists/mechanics will be on hand to assist new members with repairs, with a full workshop of specialized tools at their disposal. So why is cycling coming back? Personally, I first noticed it three years ago when I picked up my bike again after neglecting it for decades. My first step of commuting to work quickly rekindled the love for cycling I had when I was a child, and I’ve been hooked ever since. In fact, a cycling road trip to Ottawa with my wife in 2017 was one of the best experiences of my life. Here at home, even the daily ride to work made me look forward to getting out of bed to enjoy the peaceful beauty of the morning that is the secret privilege of cycling commuters. But I’m certainly not alone. People are returning to cycling as a way to become active and enjoy the outdoors again, and Steinbach is full of dedicated cyclists. Once you start paying attention you’ll notice them everywhere – bikes parked at coffee shops, workplaces or at the shopping mall. This winter, I saw more cyclists than ever taking to the streets with fat bikes and studded tires. Steinbach is poised to become a cycling Mecca for a number of reasons. First of all, it’s level! Basically any destination in Steinbach is attainable with only the slightest effort – perfect for easy commuting. I can say that there were many hills and valleys on our trip to Ottawa that I wished could “just be level”! Steinbach also remains a very accessible city with key destinations at its downtown core. Banking, postal & government services, restaurants, entertainment and groceries are all available within a few minutes’ ride from anywhere in town. Connected with a system of low-traffic residential streets, Steinbach easily has the potential to halve the amount of motor vehicles on the road. And its beautiful established neighbourhoods with over-arching trees are the perfect corridor for quiet, healthy transportation. It’s clear that Steinbach’s cycling community is growing already. If you’re a cyclist, or if you want to be, we hope to see you at the meeting on Thursday, March 28, 7:00 PM. Bring your ideas, your skills and your passion – and a friend!